Last Friday I spent the day working in a mobile with a wonderful class of Year 5/6. The topic they are studying is the Roman Invasions, which they are enjoying enormously. Their teacher, ‘Mr D.’ (as the children call him), asked if I would plan a day exploring with his students the events of the Iceni revolt. The Roman Invasions are one of my favourite areas of study in the curriculum and the students in Mr D’s class are among the most switched on I’ve ever taught: focused, self-organised, and eager to learn. They particularly enjoy learning using drama and I was excited to have the whole day to work with them. In my planning I started by asking myself questions: What must it have been like for the Iceni people when the Romans invaded? What sacrifices where they prepared to make? What resistance could they muster? At what point did they accept defeat? These inquiry questions led on to questions about narrative and evidence: What part did the story of Boudicca play in the invasion and settlement? How do we know she poisoned herself? Where did this story come from? In whose interest was it for the story to be believed? Thinking about these questions helped me to form the outline of an imaginary context, one the students could populate, and I could use to generate opportunities for them to develop knowledge and understanding of the subject. I asked myself, who at the time of Boudicca might be involved with her death and know the truth? And, why might their story have been forgotten? I decided to create an Iceni community with the class using dramatic-inquiry and incorporating a set of balsa wood model roundhouses the children had built in DT. The community, I planned, would be one that was just beginning to come to terms with the defeat of Boudicca’s army when they are faced with a terrible dilemma: one that would test their loyalty and instincts for self-preservation to the limit. In the dead of night, with a Roman legion close by, they are visited by a bedraggled Queen Boudicca desperately asking for sanctuary for herself and her daughters. What should the community do? Hand over their queen to the Romans? Hide her and hope the Romans don’t find her? Or try to smuggle her past the Roman lines? This seemed an exciting narrative for the children to be involved with, one that would hopefully engage them and give them a meaty predicament, getting to the heart of the inquiry questions I wanted them to study. There are many advantages to using a painting as a starting-point for an inquiry, but the painting won’t do the teaching for us. It is a resource and nothing more. We cannot expect the students to discover the curriculum from just looking at it and talking to each other. Recently, I’ve read a couple of accounts from people using this activity badly in the classroom and then making the procedural error of assuming there is something wrong with the activity rather than their own teaching. Both of these people were teachers for a short while and have since given it up for a career in telling the rest of us where we are going wrong. I’ll leave readers to draw their own conclusions from this. But in defence of the activity, the teacher’s role is not passive, merely facilitating the learning by providing the resource and giving the students the time and space to find out things for themselves. But far more active: asking questions, providing information, and, yes, telling the students things they don’t know. There will be periods of time when the students are doing most of the talking and there will periods of time when they will be listening as the teacher talks, this is a two-way process of what might rather grandly be called ‘meaning-making’. To return to the work I did with the Year 5/6 class on Friday. 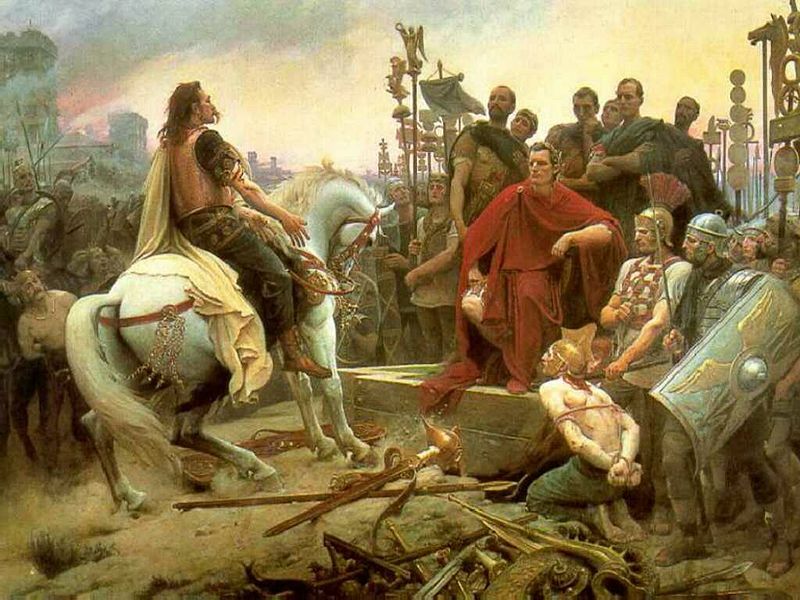 This is an account of how the first session developed using the Vercingetorix painting as a starting point. Sometimes students start to interpret the meaning of the painting or try guessing what is happening. If this happens I ask them just to describe what they can see as accurately as possible. Sometimes this can take a little while, but it is an important step. As the students worked I helped them to use precise language, modelling it for them as necessary, and asking them to try and imagine they are describing the painting for someone who can’t see it. I’ve found this can be a useful exercise in preparing children for writing. Giving them the chance to use and experiment with different words and ways of describing things and events. As the students worked through this process they began to share some of their own knowledge. I encouraged them by asking clarification and deepening questions. Of course, speculation only got them so far and they were, by this point, eager to hear more about what was happening in the painting. I spent the next ten minutes telling the students about the history of the Roman invasions and about the elements of the painting they had not discovered for themselves or had misunderstood. I told them about Julius Caesar, I told them about the Roman’s fascination for power and order, I told them about the Celts’ iconography and about their religious beliefs. After I’d finished I gave them the opportunity to ask questions. I’d like to stress that this is about communicating knowledge to the students. If you do this activity make sure you chose a painting that will get to the heart of the curriculum and make sure you have a good understanding of the history you want the children to learn. I reiterate, the painting will not do the teaching and the children cannot discover the curriculum by just looking at it. The advantage in doing this way is that, hopefully, the painting you have chosen, and the stories you have woven into it, will capture the students’ attention so that they are ready and interested to listen to the information you want to convey. While Just looking at a picture won’t do the job of teaching the curriculum effectively, neither will just telling them and expecting them to listen. The knowledge will simply slide out of their minds by the end of playtime. Making learning memorable is at the heart of our practice and both Willingham and Hirsch stress the importance of story, narrative, and tension to the learning process. The next step was to build on this new knowledge and help the students to make connections and inferences. I began a discussion about the contrast between the straight, angular, lines of the Roman designs and the more rounded, organic, shapes of the Celts. And what this observation (and others) might say about them as different cultures and what was important to them. The students began to use post-it notes to collect their thoughts and ideas. We used two colours, one for them to write the things they knew about the Celts and the Romans. The other for questions they would like to know more about. I suggested they might use the topic books they had in the classroom to help them as they worked. Once this activity was over I told the class the story of the Boudicca revolt http://en.wikipedia.org/wiki/Boudica. We then moved on to creating a proclamation from Governor, Gaius Suetonius Paulinus informing the surviving Iceni people of their new duty to obey the Romans and hand over all their weapons.